Summary: From the international bestselling author of The Lost Wife and The Garden of Letters, comes a story—inspired by true events—of two women pursuing freedom and independence in Paris during WWII. As Paris teeters on the edge of the German occupation, a young French woman closes the door to her late grandmother’s treasure-filled apartment, unsure if she’ll ever return. An elusive courtesan, Marthe de Florian cultivated a life of art and beauty, casting out all recollections of her impoverished childhood in the dark alleys of Montmartre. With Europe on the brink of war, she shares her story with her granddaughter Solange Beaugiron, using her prized possessions to reveal her innermost secrets. Most striking of all are a beautiful string of pearls and a magnificent portrait of Marthe painted by the Italian artist Giovanni Boldini. As Marthe’s tale unfolds, like velvet itself, stitched with its own shadow and light, it helps to guide Solange on her own path. I received a lot of books at SIBA -- probably too many books. 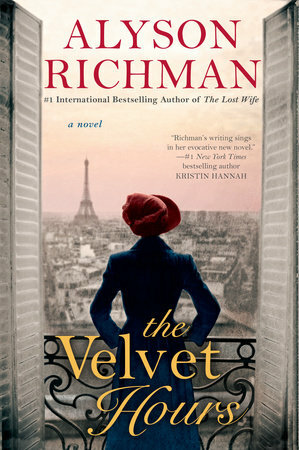 One book that I heard about at SIBA (but actually received a few weeks before SIBA) was THE VELVET HOURS by Alyson Richman. I admit that I put it on my bookshelves without too much thought (besides "What a pretty cover! "); however, after talking to the owner of Tandem Literary, I thought the book sounded intriguing. In fact, I came home from SIBA and moved that book right up on my to-read stack, and boy am I glad I did! THE VELVET HOURS tells the story of two women brought together in Paris during World War II to share stories. And get a load of this, it's based on a real-life mystery. A few years ago, an apartment in Paris was discovered that had been locked up for almost seventy years. No one in the family even knew about it until the death of their grandmother. The apartment was beautifully decorated in Bella Epoque-era furniture, and there was quite the collection of vases and paintings. But one painting really stood out -- it was of Marthe de Florian, the original owner of the apartment. You probably see where this is going. Ms. Richman became intrigued by the story and started writing a novel based on the life of Marthe de Florian, who just happened to be a courtesan. There wasn't much information on her life, so the author created one for her and her granddaughter Solange Beaugiron in THE VELVET HOURS. As Paris is facing WWII, Marthe uses her collected works of art to tell her life story to Solange, an aspiring writer. She begins with her humble beginnings as a seamstress and continues doling out her escapades, even explaining how she was painted by Boldini and how she acquired the exquisite pearl necklace. Solange is engaged in getting her grandmother's story for a potential book, and she begins to truly understand the grandmother she never knew. Meanwhile, Solange is trying to deal with some things in her own life. Her mother recently died and told Solange on her death bed that she's actually Jewish. She wants to understand her culture so she takes an antique book her mother left her and heads out to a Jewish bookstore. She meets Alec, the son of the book dealer, and begins to fall in love with him. Needless to say, discovering you're Jewish and falling in love with a Jewish man during World War II isn't the best timing. And to make things even worse, Marthe's health is failing and her father is called to serve in the war. However, Solange discovers that she has an inner strength as a result of learning so much about her family and herself. Ms. Richman is a beautiful writer. I had a copy of one of her prior novels, THE LOST WIFE, but I was shocked to realize that THE VELVET HOURS is her sixth novel! How in the world have I missed out on her books? I was very impressed with her lyrical writing and gorgeous descriptions, but I was equally impressed by her character development and storytelling skills. I will admit that it did take me a few chapters to really get into this story, but once I did, I couldn't put this novel down. I have to say that the idea behind THE VELVET HOURS is what initially drew me to this novel; however, I ended up loving the character of Solange. The world around her was crashing down and she was discovering so many things about herself. The interactions between Solange and her grandmother were heartwarming, and I found Marthe's life to be extremely interesting. She was a courtesan after all! I also felt as if Ms. Richman did a terrific job of bringing this time period to life. The items in the apartment and the dresses were described so vividly that I could picture everything, but I also thought the way she described Paris on the outbreak of the Nazi invasion was very well done. It's apparent that Ms. Richman did a ton of research while writing this novel from the way she described the fashions of the time to the way she captured the essence of World War II. I think THE VELVET HOURS would make a great book club pick. There is a reading guide available with eight discussion questions. Some of the themes you might want to explore include secrets, sacrifice, love, family, war, the role of women in society, friendship, and memories. Overall, I was extremely impressed with THE VELVET HOURS. It's a beautifully written novel that is interesting as it is touching. Highly recommended. I'll finish it today. It's such a lovely book! I really enjoyed it - probably on my favorites of the year list. I love books of this time period and I've had my eye on this book since I saw it on some other blogs.